Did my doctors miss something? According to Dr. Gary Kaplan, conventional thinking about the nature of chronic pain and depression is essentially flawed. Although physicians continue to diagnose conditions like migraines, fibromyalgia, chronic fatigue, chronic back pain, depression, anxiety, and PTSD, a growing body of research shows that these are in fact symptoms of something else—a deep-rooted inflammation in the brain. This inflammation can affect the nervous system for months-even years-to devastating effect. In Total Recovery, Dr. Kaplan demonstrates that it is possible to quiet the inflammatory state at the root of chronic pain and depression, and lays out a revolutionary new medical approach to ending your suffering and reclaiming your health. Gary Kaplan, D.O. 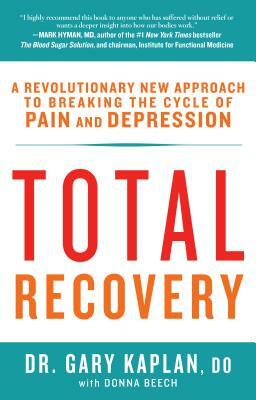 is a clinical associate professor at Georgetown University, director of the Kaplan Center for Integrative Medicine, and author of Total Recovery: A Revolutionary New Approach to Breaking the Cycle of Pain and Depression (Rodale, 2014). Founder of the Foundation for Total Recovery, his work has been featured in TIME magazine, the Wall Street Journal, Fox News 5, ABC's Good Morning America, CNN News, and NPR's Diane Rehm Show. He writes a regular column for MindBodyGreen and US News and World Report, and can also be found on Facebook and Twitter. For more information, visit http://www.kaplanclinic.com.